We are all aware, aren’t we, that before Gutenberg had his big idea there was lots of printing going on. It was done from wood blocks. Thus wood has a long history as a printing surface. Wood, being cheaper and lighter than metal was used in lots of letterpress shops, mainly for larger display sizes. Here at the AIGA website is an interview with Bill Moran, Artistic Director of the Museum and co-author of Hamilton Wood Type: A History in Headlines (Oak Knoll 2004). 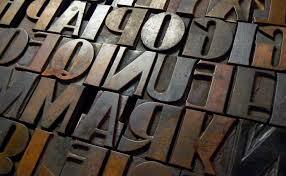 “Darius Wells of New York invented the means for mass producing letters in 1827, and published the first known wood type catalog in 1828. In the preface to his first wood type catalog, Wells outlined the advantages of wood type. Wood type was half the cost of metal type, and when prepared by machine it had smooth even surfaces, where the possibility of unequal cooling caused large lead type to distort. however, introduced a basic invention, the lateral router, that allowed for greater control when cutting type and decreased the time it took to cut each letter. You can see the process in this video from the Hamilton Museum.